Dalron Pedro, Grade 12 learner at Settlers High, says thank you. Six months ago his marks for Afrikaans were 40%. 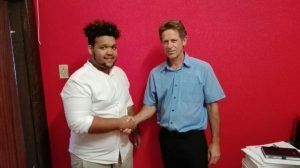 Due to SmartBrain’s intervention he passed his final year with 69% for Afrikaans. Prof Kobus Maree says in his book “Make your child brighter”, that study does not only improve the child’s performance, but it always leaves a psychological residue. He says that something remains with the child, something rubs off on the child, and that the child gradually acquires a larger frame of reference. In other words, he says: with every little bit of information the child masters, he/she becomes a little brighter.